There's a lot to be learned by studying the deadlift stances of the greats, but ultimately, each body has different strengths. Here's how to find your own best position. Q: I use a conventional deadlift stance and want to start competing in powerlifting. I watch great strongmen like Brian Shaw deadlift using a stance wider than my squat. Other famous powerlifters like Lamar Gant or Vince Anello have their heels nearly touching. How do I figure out what my stance should be? Every person is unique, right? 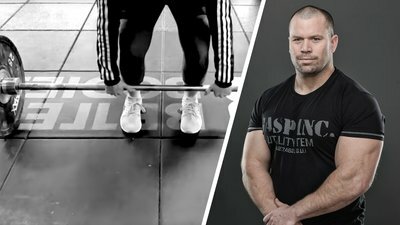 So foot placement for the deadlift will vary from individual to individual. The people you've mentioned have reached the pinnacle of strength sports, so clearly they're doing something right—or, I should say, right for them. Brian Shaw is not your ordinary guy. He's 6-foot-8 and weighs about 420 pounds. He's so big that if his heels touched, he would "crowd" the bar—not a good position for max deadlifts. He also competes in a world where "hitching" the weight up and hand straps are allowed, both of which change deadlift dynamics. Shaw is one the best at what he does, but he's not training for powerlifting. Vince Anello and Lamar Gant hit the deadlift genetics jackpot with their short torsos and freakishly long arms, both of which are tailor-made for success. They've both set numerous deadlift world records, as well as enjoying outstanding success in the bench press. But, they have their body types and you have yours. You must find your own way to your ideal deadlift stance. It does makes sense to study how guys like this do what they do. Just keep in mind you may not have the same leverage—or the same goals—as some of the greats. I hear some folks preaching about using a shoulder-width stance for deadlifts, and others who pontificate about hip-width. Here's the answer: There is no one right answer. Great people have succeeded with either style. But, there is a secret to finding out what stance is best for you. I learned it 10 years ago on the outskirts of St. Petersburg, Russia. After attending a highly classified sports-science conference and hearing the brilliant Dr. Boris Popov speak, I took him out for a night on the town. As the vodka flowed and the caviar vanished, he dropped his guard for a moment and shared the results of his deadlift-stance research with me. OK, I made all that up. I never met a Dr. Popov and have never been to St. Petersburg. But, I did hear from Bill Kazmaier that the method I'm about to share has been used for years by many Russian Olympic lifters. Here's the big secret: The starting position of a deadlift is like the take-off position of a vertical jump. Your body is smart. When you want to perform a max-effort vertical jump, your body will intuitively assume the most powerful position—exactly the position you need for a powerful deadlift. I've used this method repeatedly with my clients and, in general, it works very well. But I have noticed that when I ask some people to position themselves for a vertical jump, they tend to spread their feet a little wider. Generally, their stances would be closer to hip width. When put on the spot, though, they tend to put their feet into a wider-than-shoulder-width position. Back in the 1970s, my mentor, the late Dr. Fred Hatfield, had a great solution to this discrepancy: Jump off a bench and where your feet land is your deadlift stance. Simple! Keep in mind, though, that as your body changes, your stance might change, too. So as you bulk or cut down, or if you just feel like you've lost your deadlift groove, try Dr. Hatfield's test and see where your feet end up! With this reference point and repeated trial and error, you'll figure out, in the words of Frank Sinatra, how to do it your way.